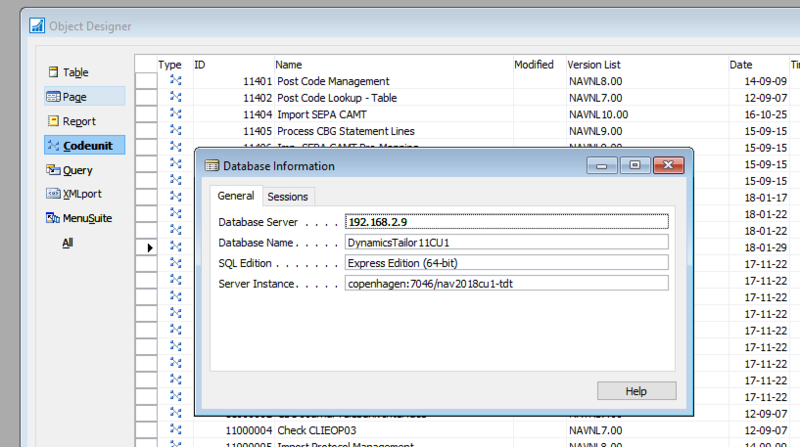 A Dynamics NAV database… on a Linux server? Let’s go ahead and admit it: I just have a thing for open source software. FreeBSD and Ubuntu Linux really tickle my fancy. Free, lightweight, fully customizable, versatile, yet world-renowned for stability. This “thing” used to be totally useless when your daily work is all about Microsoft. Recently, things have changed… Because Microsoft released SQL Server 2017 for Linux! Probably, you’re already wondering why I wrote this article, or even why I tried running SQL Server on Linux. Yes, I know, who cares about on premise installations since we have Azure and Docker? Go to this link to download Ubuntu Server. Unless you need cutting edge functionality, download the LTS version. Like with Windows Server editions, this release has Long Term Support (five years), so if you keep this Linux Server running you’ll be happy until 21.04 (for the 16.04 version). If you’re planning to run Ubuntu on a physical machine, google “unetbootin” (it’s somewhere on SourceForge) to quickly copy the image you just downloaded to a USB stick + make it bootable. If you’re running a hypervisor (Hyper-V or VMWare for example), just mount the Ubuntu image on a new system and run it. Concerning resources, I’d start with 3GB RAM and 2 cores if you’re limited – Ubuntu Server doesn’t have a GUI and is very lightweight out of the box. You’ll find the setup is very straightforward. By the way, I usually skip keyboard detection and just select “US International”. Go easy on yourself: Install “SSH” right from the setup tool. This is your “Remote Desktop Connection” for Linux. Slight difference: Your Linux has no GUI, so this is a tool to access the command prompt. If you already skipped through the screen that gives you this option: No problem, you can do it afterwards from the command prompt. Last time I did this manually is a while ago but it should work right after installation. PuTTY: Use this to access the command prompt from your Windows machine. You can run ifconfig (with an F instead of a P) from the command prompt to see the IP address of your Linux machine. Congratulations: You’ve just installed and setup SQL Server on your Linux machine! 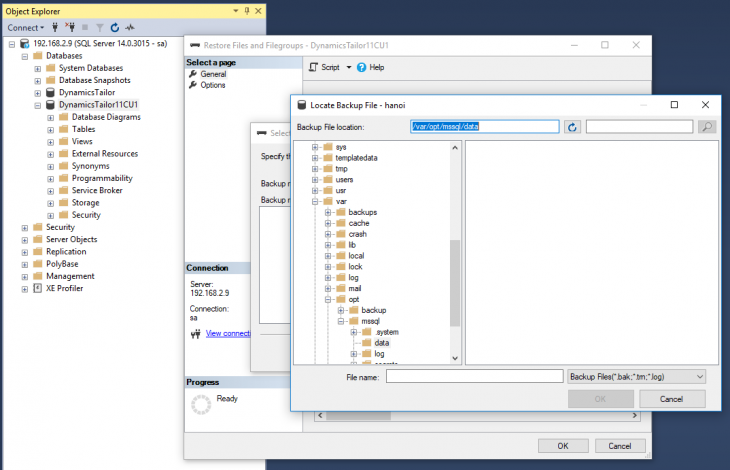 If all went well, you should now have a running SQL Server, and you should be able to login to the server from your workstation using Microsoft SQL Server Management Studio. Once the database is there, you should be able to connect through the classic “Development Environment”. But suddenly, setting up the Dynamics NAV Service Tier is not so straightforward. 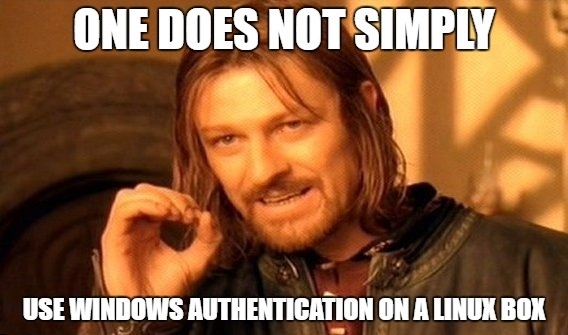 Yes, you probably already noticed this in step 3 and 4: SQL Server Authentication is back. Not a good thing in my opinion, but the Linux machine is simply not a domain member and we’ll have to live with this for now. The difficulty on using SQL Server Authentication in the Dynamics NAV service tier is in the fact that you’ll need an encryption key to secure traffic between the service tier and the database server: Normally this is handled by the domain. For production environments I’d always use a certificate provided by an official authority, but if you’re simply testing stuff I’d say use makecert.exe to generate one yourself. Where all the caps need to replaced with your values, of course. For now, I’ll be using this database server to do some development on 2018 and possibly also on 2013; if I have any news on this, you’ll read it here. If you have any issues, questions or remarks, let me know! « PreviousAdd some colour to your Dynamics NAV links!